The problem is complicated by the existing 15 unresolved issues in arms control between Moscow and Washington due to lack of desire of the latter to resolve the most burning issues, like limiting BMDS, taking the U.S. tactical nuclear weapons (TNW) from Europe and refraining from weaponization of outer space, etc. In political domain such step will undermine specific solutions at the upcoming 2020 NPT Review Conference and erect unsurmountable obstacles for entry into force of the Treaty on Prohibition of Nuclear Weapons. The reality is that the USA has de facto already withdrawn from the INF Treaty by having violated it 95 times since 2001 while testing the efficiency of its BMDS when using dummy (mock) medium and shorter-range missiles, prohibited by the INF Treaty, as intercepted targets. Russian experts believe that they can be converted into nuclear-tipped ballistic and cruise missiles any moment. There are three questions related to this fact: a) has the USA not destroyed all of them under the 1987 treaty (totally 846)? b) has Washington produced new INF missiles after destroying the old ones, and how many? c) does the Pentagon plan to make them nuclear-tipped? 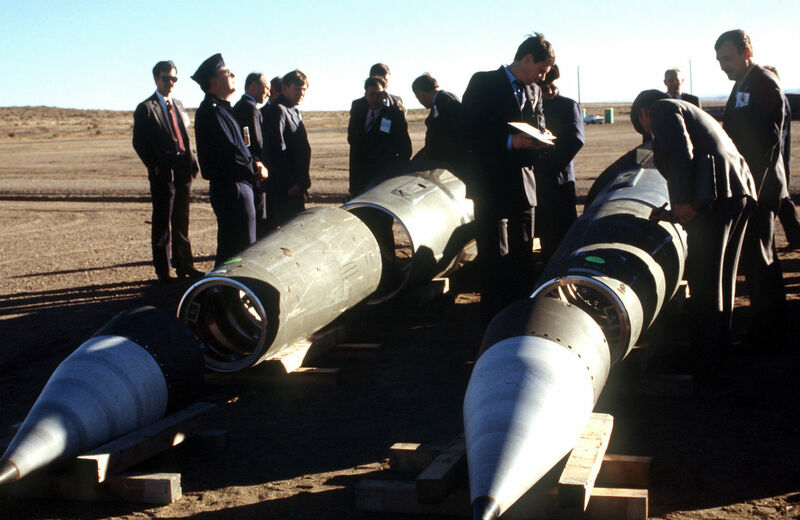 The Trump administration’s recent announcement that the United States will withdraw from the 1987 Intermediate-RangeNuclear Forces (INF) Treaty represents an unfortunate, though perhaps inevitable, end to one of the Cold War’s cornerstone arms control. Therefore, Moscow calls on Washington to ensure full and transparent compliance with INF Treaty. On the other hand, Russia has not violated the INF Treaty and is not going to be the initiator to torpedo it. During the last 6 years Washington has not tabled any vivid fact that Moscow has ‘violated’ the treaty. The purpose of such U.S. disinformation of the world community is: a) to camouflage its own new INF assets; b) to prompt Moscow to scrap 4 types of Russian missiles that are not covered by the INF Treaty provisions, namely two ICBMs, one operational missile and the newest system named “Avangard”; c) to proliferate the 1987 Treaty to the PRC who is not the party of it; d) to deploy in Europe its new mobile ground-based nuclear-capable medium-range cruise missile in order to repeat the 1979 ‘double-track decision’ of NATO. The cruise missile designated as 9M729 does not fall into limitations of the Treaty. Other types such as ‘SSC8’ or ‘SSC8-X’ does not exist. The USA has got detailed Russian explanations on this matter. There is the risk of further intentions of nuclear weapon states to pool back from other international treaties in arms control area. The USA alone has assumed negative stance towards 12 bilateral and multilateral accords in this domain. It has either violated them (e.g., INF and the Open Sky Treaty), or unilaterally withdrawn (from the ABM accord), or refused to ratify them (like CFE-1A and CTBT), or declined to debate (like European Security Treaty and Treaty on Prevention of Arms Race in Outer Space). The possibilities for using of low-yield nuclear weapons of less than 5 kiloton has sharply increased: there are 14 pretexts of using all kind of nuclear weapons in the current U.S. NPR versus two cases in the contemporary Russian nuclear doctrine. Such doctrine does not have any instructions to use tactical nuclear weapons or ‘low-yield NW’; in does not have any paragraph on ‘escalation of de-escalation” or vice versa. Current Russia’s nuclear doctrine is rooted on “conditional defensive nuclear deterrence” while the new U.S. one can be labelled as “unconditional offensive nuclear deterrence”. That is a striking difference between them. Conventional arms race may be characterized by a huge accumulation of conventional arms in the form of stockpiling forward-based assets and conducting a large-scale military drills. In recent years the number of such exercises conducted by NATO have increased two-fold. Many NATO-led initially conventionally military exercises at the end of them are transformed into nuclear-borne drills. Half of them have anti-Russian feature. There will be more NATO forward-deployed troops in the Eastern and Southern Europe. The high-caliber heavy weapons deployments of the transatlantic alliance moving closer to Russia’s doorstep cause concern in Moscow. The Baltic Air Policing Operation has been uninterruptedly conducted by NATO aircraft, including dual capable fighter-bombers of three Western nuclear powers in the Baltic airspace, since 2004. One more factor: the number of reconnaissance flights of NATO aircraft near Russian borders has increased 10 times – actually, there are such 15-20 reconnaissance aircraft per each week approaching Russian territory from all directions. The confrontational situation that has emerged during last several years has even worsened due to the continuation of the Cold War that from 2014 has acquired a new image – the Colder War or the Cold War 2.0 – that has five striking differences with the first one. The world community is witnessing not a new arms race, but rather new three-dimensional arms races: the nuclear one (it started last century), the newly-born missile defense arms race (it started in 2002 after the demise of the ABM Treaty) and the initial beginning of the outer space arms race (it commenced in 2008 when many nations refused to accept the PAROS Treaty). Therefore, military confrontation in Europe can start under any pretext – be it a deliberate provocation or unintentional action. But any potential conflict here – either backed by conventional, nuclear and BMDS capabilities – can evolve into severe armed conflict between NATO and Russia that will be very difficult to contain. No doubt, it will bring a devastating effect to this densely-populated continent. What are the practical suggestions how to avoid such a gloomy and highly unwelcomed scenarios? A Special Arms Control Summit involving NATO, the OSCE, the Collective Security Treaty Organization and the Shanghai Cooperation Organization has to be convened. It has to declare a legally-binding no-first use of nuclear weapons pledge. Such Summit should stop spreading of hostile information and painting each other black. To convene such Summit is a challenging task. It is not ‘a snap-type’ arrangement. But nevertheless the idea is knocking the door leading to the European security. It is also expedient to reach an agreement on limiting the total number of strategic BMD interceptors and their geographic deployments. The U.S. operational BMDS bases in Romania and Poland that have both defensive and offensive capabilities have to be closed down comletely. It is also vital to reach an accord not to field for more than 24 hours any kind of nuclear weapons, both strategic and tactical, outside national territory of the nuclear weapon states; to sign a new CFE Treaty applied to Europe covering the same five types of heavy weapons specified in the earlier CFE accords, and to cancel the Baltic Air Policing Operation for good. It is important to reach a multilateral treaty banning space-based striking weapons in outer space. Russia and Europe do not need any kind of arms race or any type of war – be it limited or all-out one. So, why not to reach arms control agreements between Russia and Europe separately from the USA in order to maintain stable European security on completely different footing? Only political will is required.